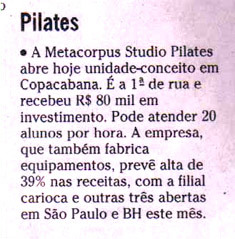 A METACORPUS STUDIO PILATES abre hoje unidade-conceito em Copacabana. È a 1ª de rua e recebeu R$ 80 mil em investimento. Pode atender ate 20 alunos por hora. A empresa, que também fabrica equipamentos, prevê alta de 39% nas receitas, com a filial carioca e outras três abertas em São Paulo e Belo Horizonte este mês. i’m so liking the idea of global citizens. heck, if we can have global non citizens (p!aestiniansl) we could really throw a monkey wrench into the game and have people revoking citizenships along w/lands of people w/no citizenships. this kinda rings a bell. a land w/no citizenship for a people w/no citizenship! free palestine! assange would fit right in.